Six years ago on Christmas Eve, several visiting families arrived with their children for our popular 4:00 pm pageant service. Their great sin? They arrived at 4:00 pm thinking there'd be "room at the inn." Which of course, there wasn't. Our sympathetic ushers offered them the chance to stand outside the worship space and be brought in for communion but, with young children in tow, they decided to just leave quietly in great disappointment. When I first heard this story a few days after Christmas, I cringed. Majorly. I could only imagine a family who, with great effort and perhaps some trepidation about walking into a new church, got the kids ready and out the door with joy in their hearts. Only to be turned away. But in the end I didn't just cringe. I decided to do something so this would never happen again. 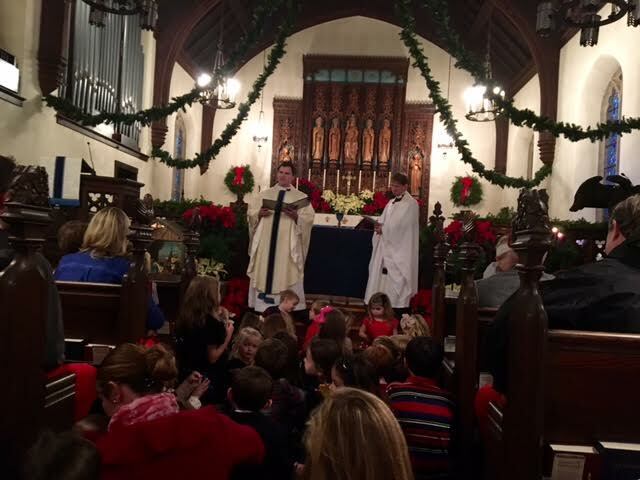 Out of this Christmas Eve fail our newly conceived 2:00 pm Tots & Toddlers Service was born. Now I'll be honest. The Pageant Service had gotten a little out of control. There's a reason I affectionately (for the most part) refer to it as the "Zoocharist." It's loud and joyful and energetic and chaotic. 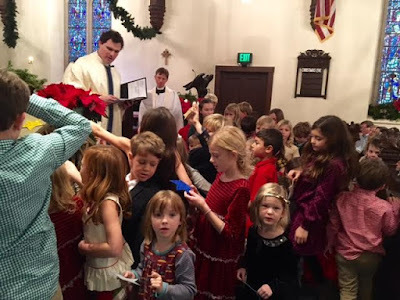 The Christmas story is told through the annual children's pageant, interspersed with carols, I read my Christianized version of The Night Before Christmas, and we share communion before sending everyone home with a blessing and candy canes. The idea in creating the new service was to take the edge off the Pageant Service and offer an informal service for parents of little children in a more relaxed environment. At Tots & Toddlers (which one parishioner still insists on calling Toddlers & Tiaras), we tell the Christmas story in an accessible way as the children help me set up the creche with all the usual suspects. We also intersperse the action with single verses of traditional Christmas carols printed in the bulletin. Since there obviously aren't enough wise men and sheep and angels, etc, to hand out to every child, we hand out stars to bring forward and place in the creche at the designated time. 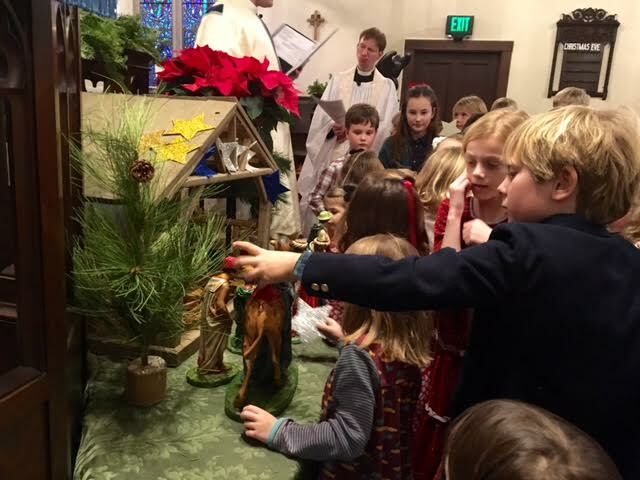 This way all the children feel as if they are participating and placing a tangible piece of themselves into the story of Jesus' birth. We then bless the creche, share communion, and send them home after 40 minutes to bask in the warm glow of Christmas expectation and wonder. The first year we had no idea how many to expect and 85 people showed up. The next few years it hovered between 100 and 150. This past Christmas Eve, it jumped to 220 and became the second largest of our four Christmas Eve services. Did it really take the edge off the 4:00 pm Pageant Service? Kind of. It's definitely not as chaotic or loud but we've since installed TV screens in the parish hall so latecomers (or those actually coming on time) can view the service on a live video feed. This year we also had our assistant minister go into Upper Weld Hall to celebrate the eucharist concurrently for the 85 people who couldn't fit into the church. But the real surprise has been the positive response from parents with young children who most likely wouldn't have attempted making it to church on Christmas Eve. It's also a way to draw our youngest children into the Christmas story in a fun, engaging, interactive way. Their faces make it all totally worth the extra effort it takes to add another service to an already full day. I'm sharing this concept because several clergy have asked me about this liturgy. I'd be happy to share exactly what we do at St. John's with any parishes for whom this might be a viable option. Ultimately, I want every single person who attends church on Christmas Eve -- whether a longtime parishioner or someone taking tentative steps towards claiming a spiritual life -- to have a positive experience. We can't afford to turn anyone away. We just can't. As you think about your line-up of Christmas services and what may work for your community, consider adding a Tots & Toddlers service. You may, like me, never look back!